A commentary on the times in which we live. And, this, in and of itself, isn't a big deal. I realize that. But it shows things in their true light. I went to A & W for lunch today. In fact, I'm sitting in the restaurant as I write this. I like their burgers. No, they're not great burgers. They aren't special gourmet burgers. They're just good burgers. And ... sometimes ... I want just a good burger. I nearly passed the restaurant, because I didn't have it in mind. But, as I approached the intersection where it's located, I had the craving. So, I checked the lanes behind me -- traffic was light -- put the blinker on, and navigated over. When I got inside, they had a sign up, advertising their Steakhouse Burger. Never had theirs. Had the one at Burger King, but I expect the A & W one would be good, too. Better than the one at BK. In my mind at least. But I never got the chance. The polite, young man at the counter informed me, "We don't really server those anymore." I wasn't sure what the "really" part meant, but I got the gist of it: order something else. I blinked once, twice, three times. Looked over at the sign. Pointed. Asked, "The burger on the sign there, you don't serve that?" "No, sir," the polite, young man said. And he shrugged. I blinked again. Sighed. Then looked up at the menu. "Let me have a Number One combo, then, if I could, please," I said. He took my order, took my money, and handed me my drink cup. Got my drink, found a seat, then decided to get the MacBook out of the car. 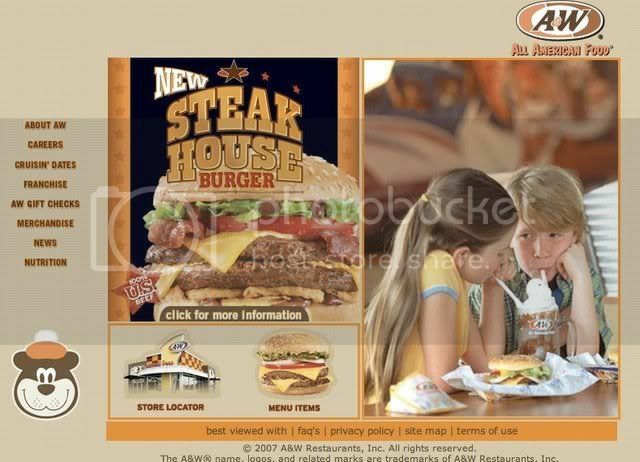 Went to the A & W Website and, sure enough, there was the Steakhouse Burger there on the front page. So, it wasn't a situation of the company discontinuing the burger. Rather, there was an issue at the local restaurant -- maybe they were out of the little onion thingies -- but, they left the sign up. Okay, like I said, this isn't a big deal. But it still says a lot. We'll say things that aren't so (leaving a sign up, advertising something that's not available). We'll pretend it doesn't matter (shrugging shoulders when asked about it). We'll accept it without complaint (order something else). And here's the worst of it. Someone will defend it as being okay. But it's not. Not in a fast-food restaurant. And not in our dealings with each other. We can do better. But will we? If I were in your shoes, I'd be sending A&W HQ a little concern!